The Nikon D2Xs Digital SLR Camera provides a 12.4 megapixel sensor, five frames per second shooting or 8 frames per second when taking photos at 6.8 megapixels. The D2Xs from Nikon also features a 2.5 inch LCD, 11 point focussing, one third step ISO and a battery which will capture up to 3500 images on one charge. The Nikon D2Xs also includes an array of minor updates together with the ability to photograph in black and white, a recent setting menu and in camera image cropping in play back. 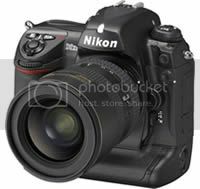 The Nikon D2Xs is expected to be available to buy in June of 2006 and will retail for the price around $4700 (USD).